Peter van Inwagen is an American philosopher and John Cardinal O'Hara Professor of Philosophy at the University of Notre Dame. He was also the president of the Society of Christian Philosophers from 2010 to 2013. The following piece is primarily a commentary on the 'Objectivity' chapter of Peter van Inwagen's book Metaphysics. Does van Inwagen see anti-realism as some kind of postmodernist fashion designed to let “anything go”? Or perhaps he sees anti-realism as advancing various political projects (i.e., instead of truth). Another fact (rather than possibility) is that van Inwagen sees idealism as being indistinguishable from anti-realism when it comes to what really matters philosophically. Michael J. Loux (van Inwagen's fellow University of Notre Dame-based metaphysical realist) also sees “subjective idealism” as “the view that we make it all up”. If we get back to the van Inwagen passage above. Winston Smith is not a realist. Or, rather, he's neither a realist nor an anti-realist. That's because the dispute between anti-realism and realism is largely a 20th century phenomenon within the domain of Anglo-American analytic philosophy. In addition, anti-realists don't necessarily have specific positions on politics or on anything else (i.e., other than on anti-realism and its relation to realism). Anti-realism can of course be applied to other subjects; though it's not necessarily tied to any other subject. Not only that: it's often said that anti-realists can be anti-realists in one domain and not in other domains. And even when anti-realists do apply anti-realist ideas to a particular domain, they still say different things about other domains. “[W]e [realists] can, in good conscience, go on believing in a mind-independent reality and go on as well believing that metaphysics gives us access to the nature of being qua being”. If we concentrate on van Inwagen, it can be said that just as van Inwagen defines the words “objective truth”, “anti-realism” and even “realism” itself in his own individual way (as will be seen later), so too does he do the same with the word “metaphysics”. For a start, even if there are philosophers who deny that we can “get behind all appearances” (or whom reject the very notion of appearances), can't we say that they're still doing metaphysics? More importantly, the final clause (i.e, “describe things as they really are”) begs the question against anti-realism. Thus, from the beginning and even before any analysis/debate begins, van Inwagen is saying that anti-realists (as well as idealists, phenomenalists, Kantians, etc.) can't actually be metaphysicians. Why? 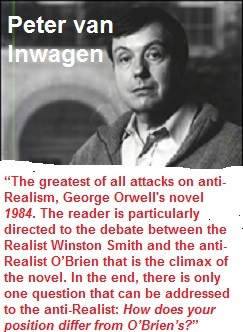 It's because they aren't realists in the manner in which van Inwagen himself is a realist. “metaphysics is the attempt to discover the nature of ultimate reality”. It's true that anti-realists emphasise their epistemological approach to metaphysics. Yet that's still an approach to metaphysics. It isn't automatically a denial of the possibility or existence of metaphysics. Or, rather, it is if one accepts van Inwagen's position in full. Indeed it seems that one has to accept van Inwagen's position in full if one wants to continue doing metaphysics. To repeat: if one doesn't abide by van Inwagen's take on both realism and anti-realism (as well as his take on metaphysics itself), then one can't be doing metaphysics at all. Does anyone really know what the word “ultimate” means in the context of the often-used phrase “ultimate reality”? “there is such a thing as ultimate reality, a reality that lies behind all appearances”. Now even if the word “ultimate” simply means reality as it is regardless of minds, we can still ask why the word “ultimate” has been used. In addition, many anti-realists will say that even if there is a reality that “lies behind appearances”, we can still never know what that reality is (or what it's like). So why use the adjective “ultimate” at all? Can x be an ultimate anything if it can never be known, seen, experienced or whistled? And how, exactly, does reality “lie behind” anything? What does it mean for reality to lie behind appearances? Indeed it can't it be said that appearances also belong to reality? What else can appearances belong to? As stated, I don't suppose for one second that most (or even any) anti-realists believe that “nothing is independent of the mind”. There are lots of things which are independent of the mind. However, once we speak of them, describe them, or have knowledge of them, then they become (by definition) dependent on minds. These things aren't literally created by minds - though they do come to be known or experienced by minds. “our beliefs and assertions is therefore 'objective' in the sense that truth and falsity are conferred on those beliefs and assertions by their objects, by the things they are about”. Of course no one would doubt or deny that statement S is about the things it is about. The problem is how we make philosophical sense of that claim. Van Inwagen also assumes too much when he talks about what he calls “objective truth”. Firstly he tells us exactly what he takes objective truth to be. And then he says that when his definition is rejected or denied, then objective truth is automatically rejected or denied too. Yet we needn't accept van Inwagen's take on objective truth. “those statements would be objectively true that correctly described the ultimate or context-independent reality”. In other words, van Inwagen is telling us that we have to accept both ultimate reality (as well as his philosophical take of it) and context independence before we can claim objective truth. However, that isn't a logical claim. It's not an epistemological or metaphysical claim either. Instead, it has all the hallmarks of a stipulative definition of the two words “objective truth”. A philosopher can easily argue that objective truth has nothing to do with “ultimate reality” or “context independence”. Sure, he'd need to argue his case and perhaps his arguments wouldn't be very convincing. However, this option is on the table; yet van Inwagen seems to assume that it simply doesn't even exist. Take just one example. Hartry Field has written an entire book called Truth and the Absence of Fact; as well as a paper called 'Mathematical Objectivity and Mathematical Objects' (in which mathematical objects are denied or rejected). Now Hartry Field's arguments may be airtight or they may be rubbish. But at least his option is in the marketplace. And there are many other similar options in the marketplace too. We can go into more detail here. How would we know that statements “correctly described the ultimate or context-independent reality”? This too makes an obvious assumption. In order to know that our statements correctly describe ultimate reality, we'd already need to know ultimate reality in order to be sure that the matches between our statements and ultimate reality are correct. We'd also need to explain how statements (as bits of a natural language) could match things that aren't themselves statements (or bits of a natural language). In addition, does the tie between true statements about ultimate reality itself also partake in ultimate reality? For example, is the correspondence between the statement “Snow is white” and snow's being white itself an aspect of ultimate reality? What's more, do natural-language statements about ultimate reality themselves belong to “appearances”? And if not, why not? As for context-independent reality: how can we gain access to it? What does it look like? Or, perhaps more correctly, what is it like? Can a context-free reality even be described or whistled? Whatever x is, x will be as x is regardless of human minds. But that's to say very little. Almost nothing. All we have is what people have said about Mount Everest. The claim that minds don't change the nature of Mount Everest doesn't get us anywhere. It doesn't get us anywhere practically. More relevantly, it doesn't get us anywhere philosophically either. It's a claim that has very little substance. Despite that, it purports to tell us something profound about the force of metaphysical realism. So an anti-realist doesn't need to deny that any x is “entirely independent of all human mental activity”. However, he does have a problem with the prefixed statement: “the fact F is entirely independent of all human mental activity”. That's because it includes the predicate symbol F and also uses the word “fact”. It makes little sense to say that facts are “mind-independent”. So, in this context, van Inwagen believes that the world is cut up into “sentence-shaped objects”, as Peter Strawson once put it. That means that not only is the mind-independence of the world important to van Inwagen, so too are the many (or infinite) sentence-shaped chunks of the world - those bits which precisely match true statements. x [an obviously unquantified variable, in this case] is how it is regardless of minds. x is independent of minds. What we say about x isn't. Thus x's ontological purity is “collapsed” (to steal a word from quantum mechanics) by minds once things are said about it. Or, to use Kantian phraseology, when x is talked about, it immediately moves from being a noumenon to being a phenomenon. Van Inwagen also conflates idealism with anti-realism. “And is not anti-realism the thesis that there is no mind-independent world 'out there' for our sensations to be true or false statements about?" Idealism and anti-realism are very different. Despite what van Inwagen says, anti-realism does not state that there is no mind-independent world “out there for our sensations to be true or false about”. It says that there is one; and it's causally responsible for our sensations and our true and false statements. However, as it is “in itself” (i.e., in its mind-independent state) is of no meaning or purpose. It's a difference which quite literally doesn't make difference. The relation between true or false statements and a mind-independent world cannot be logical. Since true or false statements are not the mind-independent world. What then is the relation? The answer is, I think, obvious: the relation is causal. The mind-independent world causes some true or false statements and in this sense are the basis or ground of those true or false statements. But a causal explanation of true or false statements doesn't show how or why those statements are true or false of the mind-independent world. As hinted at, it can't be said that this rewriting works in all respects. That's primarily because Davidson was talking about the justification of beliefs, not the relation of statements to the world. Nonetheless, the form of the argument still stands and the central point about causation does too. I suggest that we give up the idea that true or false statements are grounded on something that counts as an ultimate reality. No doubt true or false statements ultimately depend on the mind-independent world. But this is the 'depend' of causality, not mind-independent truth or fact. So, to repeat, anti-realists don't reject a mind-independent world (though some brands of idealism do). Instead, anti-realists simply has a different take on the mind-independent world. In Davidson's terms, many of our true and false statements causally “depend” on that mind-independent world. However, that mind-independent world doesn't and can't in and of itself guarantee us truth. Since we've just discussed idealism, it's worth commenting on something else that van Inwagen writes in this respect. Firstly, van Inwagen simply assumes that the position above is wrong without actually saying why. What he appears to be saying is that since the person painted is painted as being alone, then the actual painting itself must somehow represent that person's genuine aloneness. In other words, the subject has been painted form literally no “point of view”. But clearly all paintings of people ostensibly on their own are painted from a point of view. There's not even a possibility of painting a lone person from no point of view – not even conceivably (except, perhaps, in some very abstract piece). "But, say you, surely there is nothing easier than for me to imagine trees, for instance, in a park... and nobody by to perceive them... The objects of sense exist only when they are perceived; the trees therefore are in the garden... no longer than while there is somebody by to perceive them." So when one imagines a tree (or person to be painted) without anyone looking at it, one actually imagines someone looking at a tree (or looking at the person to be painted) – except that the observer (or painter) isn't supposed to be there. Now of course realists, anti-realists or idealists/phenomenalists don't need to rely on this argument about our imaginative limitations to establish their positions. Nonetheless, Berkeley was still at least partly justified in saying what he said. Despite that, van Inwagen may be correct to argue that “mind-independence  does not require those to whom the argument is addressed form a mental image”. That's certainly the case if one is talking about “unobserved geological processes”. But it doesn't follow from this that what's been said also applies to a painter painting a supposedly unobserved person. Nonetheless, if mental images are out of the question for ancient geological processes, then so too are “certain verbal descriptions of those [geological[ processes”. That's because even without mental imagery, verbal descriptions are still at least partly – as well as obviously - a result of minds. Regardless of mental images, those descriptions will include contingent natural-language words, concepts, and whatnot. To put that another way: these seemingly mind-independent geological processes could be described in other ways – indeed in an infinite number of other ways! Van Inwagen assumes that anti-realists deny or reject objective truth. Not all of them do. He also assumes that everyone must accept his own definition of the words “objective truth”. This is problematic because if they do so, then van Inwagen's conclusions about self-referential self-destruction would indeed be correct. So, again, anti-realist needn't deny the notion of objective truth and they certainly don't need to accept van Inwagen's own personal definition of what constitutes objective truth. The other problem with van Inwagen's analysis is that even if anti-realists accepted the statement “objective truth and falsity do not exist”, what van Inwagen says about this statement may not be the case. Anti-realists could take the statement “objective truth and falsity do not exist” as a second-order (or a meta) statement. Either that or as a principle (normative or otherwise). In other words, it's a statement about statements, not a metaphysical statement. That is, it's not a statement about the nature of the world: it's a statement about statements about the world. Another way of putting that is to say that it's an epistemological take on statements about the world. i) Peter van Inwagen misrepresents the positions of most anti-realists. ii) He at least partly conflates anti-realism with idealism. iii) And he defines terms such as “metaphysics”, “objective truth” and "anti-realism" in such a way that renders all his opponents straw targets or self-contradictory. Finally, van Inwagen assumes that ant-realism is a much wider philosophy than it actually is.